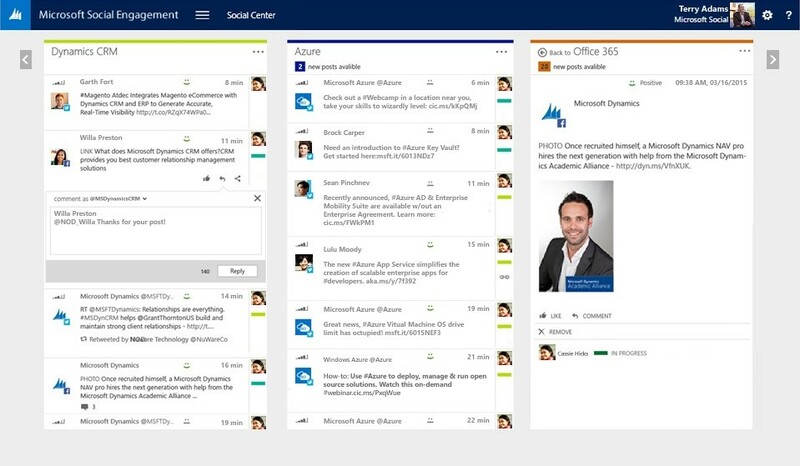 Microsoft Social Engagement 2015 Update 1 Product Documentation is Available! Update: To see Microsoft Social Engagement in action, check out this video! With the redesigned user interface, which puts the information up front, it’s easier than ever to navigate in the product and find the posts that matter to you, so you can analyze and take action on them. Engage with your audience on Facebook and Twitter, directly from within Social Engagement. With Social Center, you can create and share user-based streams of posts to follow conversations and collaborate when working with posts. Assign posts to other users and add custom labels to a post. You can also authenticate social profiles and reply to posts or direct messages in real time. Clickable areas on widgets let you visually add or remove filters for quick and interactive analysis. Additionally, you can now access posts from every page in Analytics, providing a convenient way to read the actual contents. Content analytics are key to understanding what people are talking about on social media. We’re introducing the new Conversations page in Analytics to provide deep insights into the content of the social conversations. We extract important phrases from all social posts in your data set, not just a sample, to provide a clear view into what’s on the minds of your customers and stakeholders. and search languages into account. You can display the user interface for the Analytics areas, Social Center, and Search setup in either a light or a dark color theme. To prepare for what’s coming, visit Get ready for the next release. Microsoft Social Engagement Help Center is the central information hub. Social Engagement Help & Training – The place to find end-user help and training.